Betty Johnson, a retired, veteran workers’ compensation claims professional from the Los Angeles area, died on April 3, 2018. She had been ill.
Betty died of breast cancer that had spread to her bones. She had been suffering from back pain for months, was taking strong medication, and then finally was diagnosed with cancer as the cause of the back pain in July of 2017. Betty had retired as a senior claims examiner professional from Sedgwick Claims Management in their Encino office on April 10th 2015. She had been working for many years on the Dignity Health account. But back starting in the 1980s, Betty worked for Industrial Indemnity. As she was retiring, she remembered those “Pre-90 days”. Fremont General acquired Industrial Indemnity in 1997, so Betty worked for Fremont for a time. 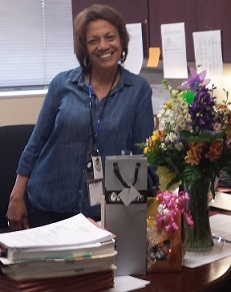 A photo of Betty sent by Betty to adjustercom at the time of her retirement from claims handling in April of 2015. She retired while at Sedgwick Claims Management on the Dignity Health account. After retirement from claims in 2015, Betty became a realtor and worked out of Keller Williams in Calabasas. She resided in Sherman Oaks for many years. She is survived by two daughters, April and Karen. April is a teacher in the Los Angeles Unified School District. Karen had worked with President Bill Clinton. She is also survived by two grandchildren who are the offspring of daughter April. Her funeral will take place on Friday, April 13th 2018 at 12:30 pm. The location is Church of the Hills at Forest Lawn in Hollywood: 6300 Forest Lawn Drive, Los Angeles, California 90068. A repast will follow the burial at a private residence. Flower arrangements should be sent directly to the venue and scheduled for delivery on Friday, April 13th by 11:30 am under the name Betty Ann Johnson. 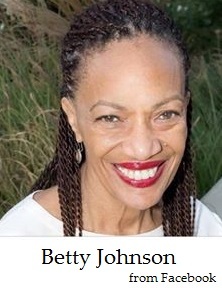 Belissa Martin, Forest Lawn Flower Shop Representative, can also be reached at flowershophh@forestlawn.com, 323 769-7365.
adjustercom extends condolences to the family and friends of Betty Johnson. Obituary by Lonce Lamonte, lonce@adjustercom.com, adjustercom. All rights reserved. For reprint rights and permission contact Lonce by email. 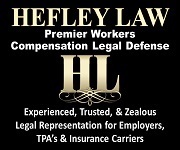 *Updated at 10 am on April 13th 2018 with information from workers' compensation adjuster Valerie Kizer. Added that Betty died of breast cancer that had spread to her bones. Also that she had two daughters and not one. The daughters' names were added plus that Betty had two grandchildren. Betty was also a long term resident of Sherman Oaks, California. Thank you Valerie.